The Swedish Standard House receives recognition! Faithful readers of my blog will remember the Swedish Standard House in Rockford Illinois. This is a home built by Swedish and American high school students, built with walls and framing that approximated Swedish building standards, hence the name. The house is done, the students have finished it, and the project is receiving an award from their local Renewable Energy Association. On Friday the 8th of November the Swedish Standard House team will receive an award at the Winnebago County Renewable Energy Expo. The Expo's theme is to learn about renewable energy options and funding, network with industry experts and local businesses already utilizing renewable energy practices, and gain a better under­standing how renewable energy practices can be applied in the real world! 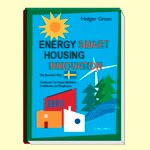 We have written about the Swedish Standard House before. We gave the background for the project, described its construction in detail, and made a short video showing the wall build. The house was recently completed after two rounds of visits by Swedish students this fall. Since the work proceeds at the pace of the academic year of the American and Swedish students, the project stretches out even though the work proceeds at the same pace as conventional construction. I'll repeat my message from earlier posts. The Swedish Standard House represents a way forward for home building in the US, because it achieves a high level of performance with very ordinary construction materials. There is very little learning curve to build a house this way, and builders all ready have the skill set to do this. It does not require new methods or materials, and it enables builders to use the same sub-contractors and suppliers they already use. And most important they already have the experience to reliably price the work, which means there is very little in the way of additional risk required for a builder to adopt these methods. This is why this kind of building points the way forward, and why the Swedish Standard House is the Most Important Green House in America. So check out those links and join me in a tip of the hat to the Swedish Standard House. Here is hoping it is the first of many more all across the country. Continue reading "The Swedish Standard House receives recognition!" Things have been moving along at the New Arkansas Plat House. Siding is on, much of the interior is finished, and the builder is putting on the finishing touches. We've seen photos of the bathroom and kitchen fit-out finishing up over the past few weeks. But this is our first peak at the finish of the siding and deck. One of the most fun things going on is the handrails of the deck. In an homage to the Texas Plat House the Owner has used a welded wire pen panel for their handrails. 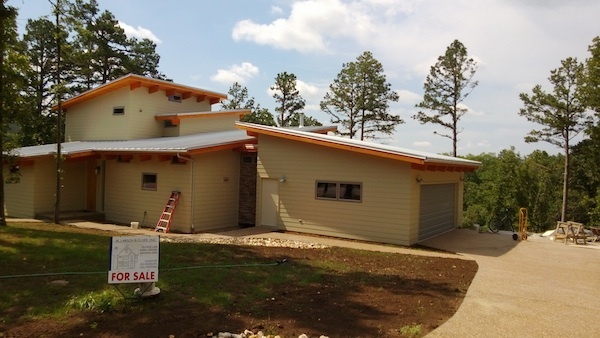 Continue reading "New Arkansas Plat House: moving close to finished"
For the first time since we launched our online catalog of Modern House Plans in 2002 we have opened a new section which you see now in our web site's navigation bar: For Builders. The plan has always been to change housing in the US. Where we started from there were no modern house plans, and you could not go out an buy a modern house unless you bought an old modern house. Aside from that you had to hire an architect to design you a custom modern house. We wanted to change that. We wanted anybody who liked a modern house to be able to buy one. So Modern House Plans were our contribution. I don't believe for a minute that its the best answer to the problem, or the only answer to the problem. But it was something that we could do. When we started this venture I always said there was a three part plan to this idea. Part one was to make modern house plans for the catalog. In order for modern house designs to be readily available, there had to be modern house designs for people to have. There is always more work to do in this regard, but we've made great progress here. We have over 20 houses in our catalog now, all developed over the past 10 years. The second part of this plan to change housing in the US was we had to get people to build these houses, so we could prove to the industry that there were people that liked modern houses. And to prove that there were enough of them to make building modern houses worthwhile. Again, there is always more work to do in this area, but I think we've shown the interest is there. Despite the gargantuan fail of housing several years ago, and the tepid return of the market, once again we can say with some confidence that customers are eager to build our modern designs. Part three of the plan is about to start, because part three is to convince builders and developers in the US to build Modern Houses, at least some modern houses. With even just a small offering then anybody who liked modern but was not of the mindset and risk to build their own, then this kind of customer could just go to a builder and find them completely willing to sell them a modern house. And if we had our way, they would have several kinds for the customer to pick from. This is the Holy Grail of modern houses. The only way we'll see a fair representation of modern houses in the market is if builders are willing to build them and sell them. Only then will customers really have a fair choice, one where a modern house is an option. That ladies and gentlemen is part three of the plan. To that end we've launched our Builder Developer Portal on our catalog site. Through this page we will offer an unprecedented level of support to Builder/Developers willing to venture into the waters with modern design. We are extending discounts on volume purchasing, we are offering planning and marketing support, and we are offering access to our network of interested home owners. Builders who are willing to serve this market will have our full support, and everybody in our network will know about it. And mark my words, you will be a hero to a large unserved market of homebuyers, your name will be called from the modern rooftops, and songs will be sung about your bravery. Most of that will happen on the internet. We don't expect progress to be made overnight. Every step of this journey has taken time. But the moment has come to reach out to builders and developers to work towards a broader offering of modern designs in the housing industry. If you want builders in your region to offer this kind of house, then point them right here and lets get started! Continue reading "An Invitation to Builders and Developers"
New Arkansas Plat House - interior things like cabinets happening! Things are moving along with the New Arkansas Plat House. Painting is happening, so there is color! And cabinets have arrived and no time wasted putting them in their place. As usual, new photos of the progress on the house are posted to our Flickr set for the house. And you can find the Plat House in our catalog. 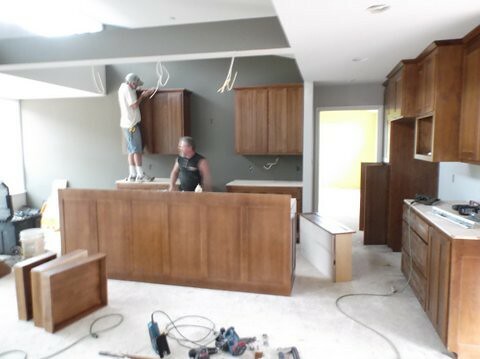 Continue reading "New Arkansas Plat House - interior things like cabinets happening!" We've been following the New Arkansas Plat House in the blog, but regular readers will recall that I've mentioned a few other houses that were under construction. 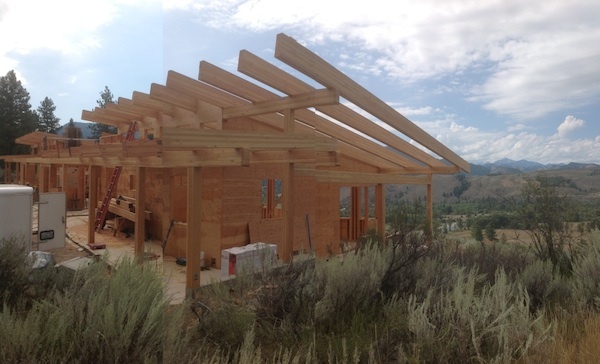 In Oregon this glue laminated timber frame modified version of the Plat House is well under way. This is going to be a pretty spectacular Plat House that I think will live up to the setting. Continue reading "Customer's Houses under way"
With all the excitement about new designs around here lately we have not forgotten about the roll out of the 0862 XHouse1 Construction Prints. To celebrate we've prepped a little interior virtual reality view - 360degrees up down and all around! Just click on the picture above to load the virtual reality view. This is based on the QuicktimeVR platform - which is an old school format for 360 images like this. If you don't have the Quicktime software installed you probably won't be able to see this." As always the 0862 XHouse1 is available in our catalog. 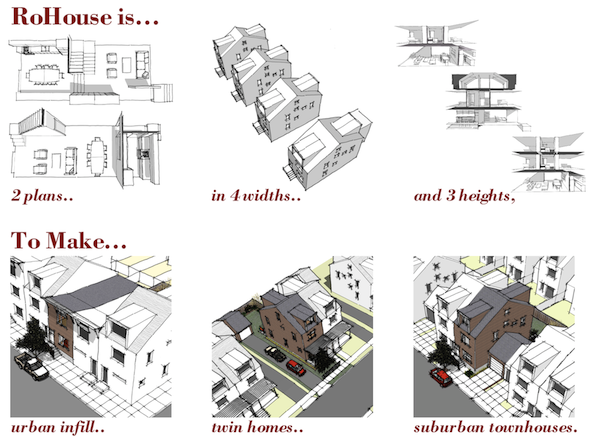 Continue reading "0862 XHouse1 a peak inside"
The RoHouse family of compact houses for urban infill, twin homes, and suburban townhouses has been rolled out and is now in the catalog. Design Prints of RoHouse are available now, and Construction Prints are available now on a Pre-Order basis. 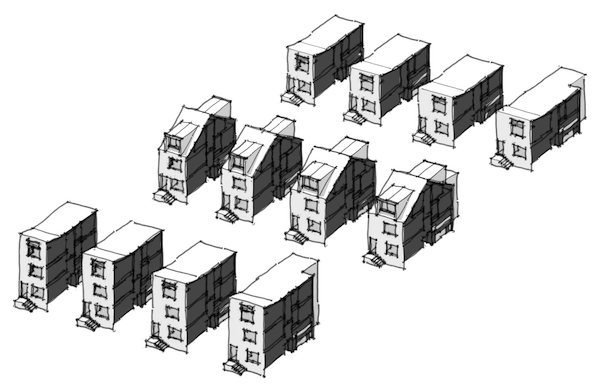 Continue reading "1204 RoHouse rolled out in the catalog"
This is the second example we have prepared for applications of the RoHouse - Urban Infill in groups and on scattered sites. Because of the variety of sizes that the RoHouse is available in, you can easily find one that fits well in a single or pair scattered site infill. And when doing big or bigger groups of new houses, the range of sizes allows the developer to offer houses to suit a variety of budgets, and give the streetscape that organic diversity that makes cities great. 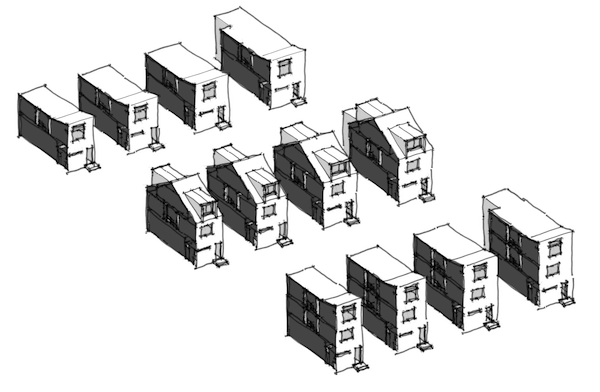 Continue reading "1204 RoHouse for urban infill sites"
Some simple schematic models of the RoHouse range, to give you an understanding of all the variations which will be available. Transverse stair plan in 14ft, 16ft, 18ft, & 18ft expanded; 2 story, 2.5 story, & 3 story. Longitudinal stair plan in 14ft, 16ft, 18ft, & 18ft expanded; 2 story, 2.5 story, & 3 story. Continue reading "1204 RoHouse - diagrams of the range"
We are now working towards Design Prints, and a presence for the now dubbed RoHouse in the catalog's XHouse Collection. The challenge remains to figure out how to concisely represent the diversity of plan offerings here. Continue reading "Row House Concept - twin house configuration"
We've reached a milestone in the design of the Row-House plans. The schematic layout of this collection of house designs is done. We now have to choose how to present these designs in the catalog, and for the first time post a group of houses that we have no intention of completing in advance of demand. 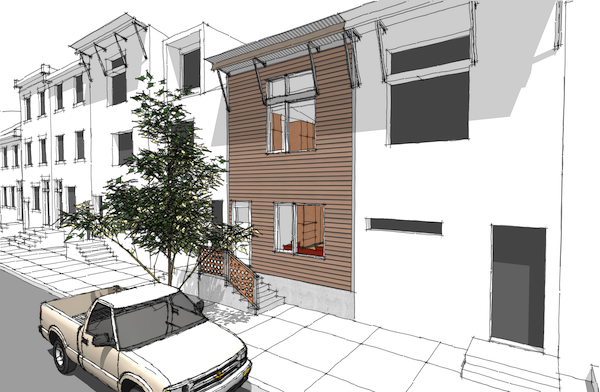 There are three distinct situations that we've designed these Row-Houses for. 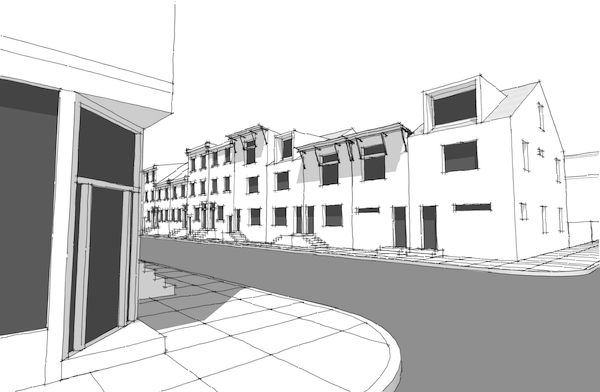 Urban in-fill sites; new development at row-house densities, and twin-houses, or duplexes for a transitional density between freestanding houses and attached row-houses. As such these designs extend the range of our offerings down to the smallest lots, highest densities common for American houses. Continue reading "Row House Concept - moving from concept to execution"
We are thrilled to officially announce that the Construction Prints for the0862 XHouse1 are complete and now offered on the catalog page. The XHouse1 came into our catalog in 2008. The housing market had already blown up, and nobody was building houses, let alone modern houses. The design was posted to the catalog, spurring a new Collection, and shortly thereafter somebody had ordered a set of the Design Prints. Then 5 years passed without the release of the Construction Prints. Continue reading "0862 XHouse1 - Construction Prints complete"
Currently in production in the studio are the Construction Prints for the 0862 XHouse1. I see this house design as a puzzle I laid out 5 years ago, and now I am finally getting a chance to solve it. The XHouse1 was the first design in what was a new Collection of designs - the XHouse Collection. This was the first move to expand our plan offerings into different collections, and this was the first house design to deviate widely from the design themes of the original collection of plans. So this is, and has been an important design for us, a turning point. 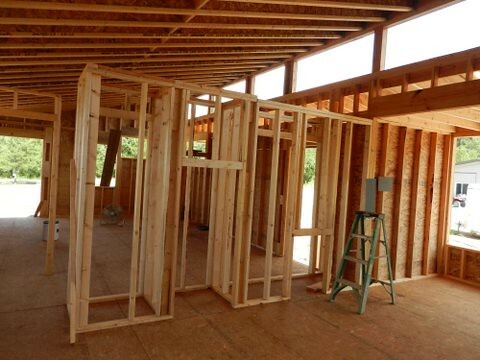 Continue reading "0862 XHouse1 - solving a puzzle laid out years ago"
With the shell of the house complete, the carpenters have moved on to framing up the interior of the Plat House and we can see some familiar spaces beginning to emerge! More shots of the interior framing are posted in the Flickr set for this house. Continue reading "New Arkansas Plat House - interior framing up"
Plat House influence in Arkansas - amazing! The Arkansas contractor who built the second Plat House in Arkansas has built a spec house that is modern and clearly influenced by his work on the Plat House! It is currently for sale now. Well, I have to hand it to him after all - if I did not know the influence, it would just seem a contemporary house. Look what has happened here: Its likely this house would have never been built in this style if he did not know of the first Arkansas Plat House and had built the second one. This is exactly the kind of influence we wanted to create with the house plans. This is how tastes are influenced. I take it as a victory! Continue reading "Plat House influence in Arkansas - amazing!" Spring has come and Summer has begun at the Maine Plat House. 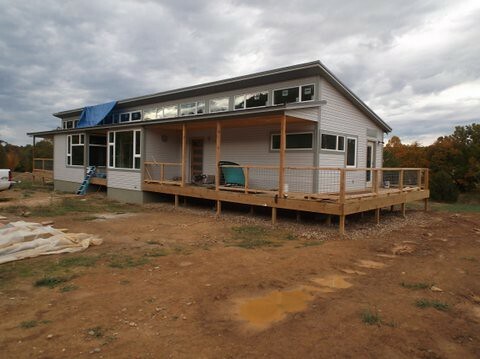 Those of you following our customer builds will remember this house finished up in the fall. The owner has spent the first winter in the house, and now is starting the first summer. 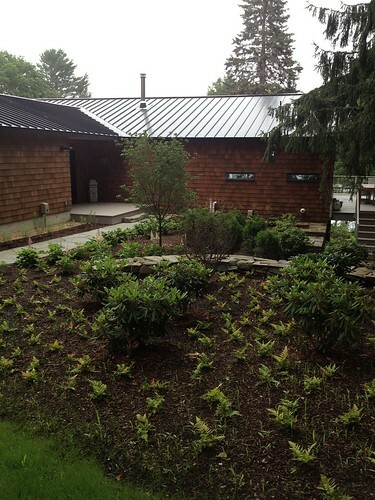 The landscaping is new and fresh, and the Plat House looks completely at home in its Maine waterway setting. Wide decks overlooking water in the distance - sounds just like the illustrations in our catalog! Please go enjoy more photos of the house in our Flickr photo album. And thank you to our terrific home owners who share the pictures of their beautiful homes! 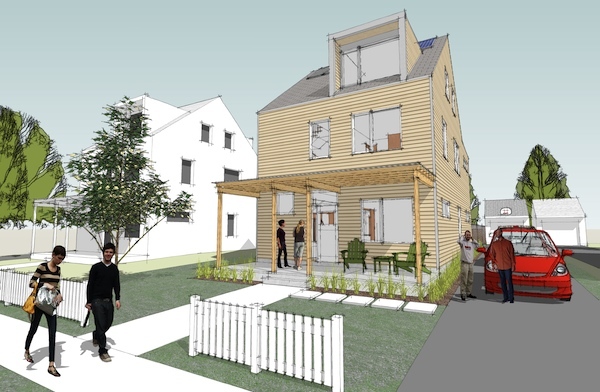 Continue reading "Spring has sprung at the Maine Plat House"
So far in our documentation of our Row House design process we've discussed the overriding organizing type that results from the transverse or longitudinal stair. At the same time we've been developing three different versions of each type - a 2 story house, a 2.5 story house, and a 3 story house. These three house sizes allow a range of accommodations even as the footprint remains the same. The basic 2 story house yields a 2 bedroom house design with a low slope roof. The roof however slopes at greater rate in the front bedroom creating a higher ceiling and a loft like feel. But even this most compact version of the house can be had with the expanded floor plate, yielding a 3 bedroom plan with additional living space on the ground floor. Continue reading "Row House Concept - the case for 2, 2.5, & 3 story"
Its always gratifying to see one of our designs placed into a setting for which it was designed. The point here has been to bring custom like design to people who could not afford or justify the expense of custom design. And so someone like you can now have a house like this that works so well with its beautiful setting. A screened in summer porch is planned for this side of the house - a nice option when your Plat House is not close to a road and you have privacy on all sides. 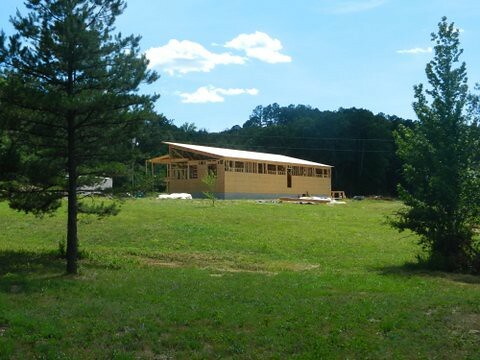 Continue reading "New Arkansas Plat House - beautiful setting"
New Arkansas Plat House - we have a roof! The roof is going on in a flash! This stage of framing is always exciting because the carpenters make such notable progress each day. 5 more photos from this day in the Flickr set. Remember that there is both the original two bedroom Plat House, and the slightly bigger 3 bedroom Plat House 3. Continue reading "New Arkansas Plat House - we have a roof!" Although I've not been reporting on it here on the blog, followers on G+ and Facebook know I have been moving the Row House concept along at a steady pace. I thought it was time for an update. Last time I reported on this effort I showed the range of designs for the Transverse Stair paradigm. Today we'll look at the Longitudinal Stair paradigm. The nature of the Transverse Stair is that it divides the floor plate into two halves. This works well on the bedroom floors, however on the living floor it dictates a division between the living program of the house. In the Transverse Stair version we exploited that by emphasizing the division with a change in level. We put the living space up front, and a multi-function kitchen and dining space in back. The nature of a Longitudinal Stair is different. It lives along the side of the floor plate, and depending on if its in front or rear, it exerts a different influence. I've chosen to move to the rear, a more modern attitude I think. In my mind this embeds the stair deeper into the family life of the house. Instead of being greeted at the front door by the passage to the most private areas of the home, the stair instead comes down into the heart of the living areas. The stair located at the side of the floor plate allows a more open and fluid treatment of the living space. I've chosen to make a discreet kitchen workspace at the front of the house, to form a physical buffer from the street, and allowing for a larger open living and dining space at the rear. This is a deliberate contrast from the configuration of my Transverse Stair model. Continue reading "Row-house concept - longitudinal stair plan"
A few more photos in the Flickr set today - wall framing has begun. See the rest in the Flickr set. 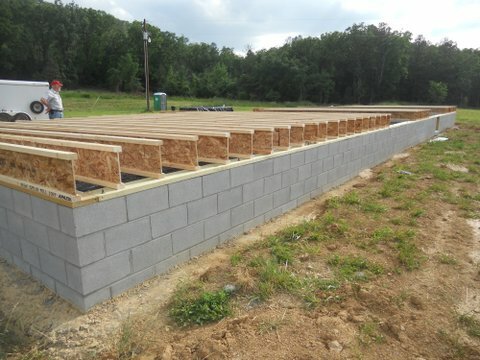 Continue reading "New Arkansas Plat House - walls begin"
The floor deck is complete, and the wall framing will be coming next. Nothing takes the mystery out of building a house like watching it go together. Photos like these from past Plat House customers have been very important tools for new owners to show their builders how the houses go together. Because the Plat House and our other designs for that matter don't look like a traditional house the builder may often assume that the construction will be unusual. There have been many cases where the builder's review of photos like these help put those fears to rest. See the Plat House in our catalog, and more photos of customer's builds in our Flickr sets. Continue reading "New Arkansas Plat House - floor deck complete"
We've been lucky enough to have access to some professional photography of two of our house projects. It is amazing how much nicer a home appears when shot by a competent photographer. Maybe some day we'll be able to have more customers homes shot this way, but for now here is a sampling of two houses. 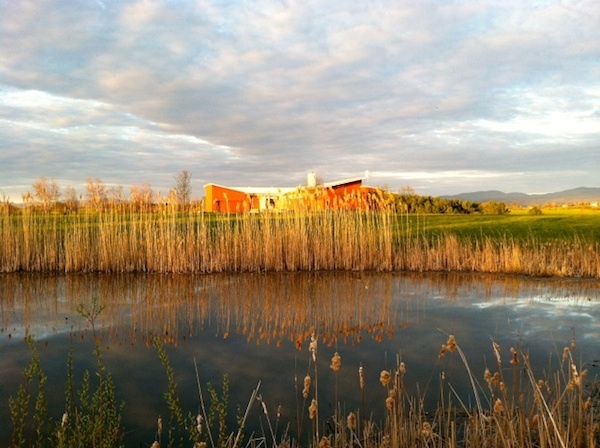 Right now you will find a dozen shots from this set only on our RS House project page at Houzz. 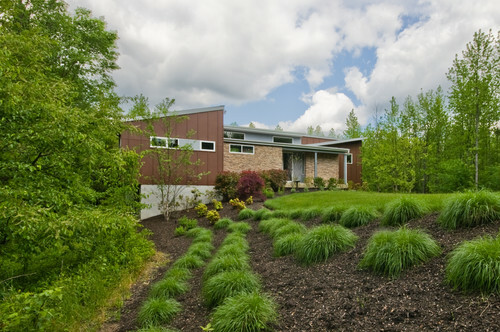 More great shots of the Vermont Plat House can be seen on the project page at Houzz. Continue reading "New Photography of two projects"
The XHouse5 is now complete and ready to order, and ready to build. Our favorite news is news of new designs in our catalog, so I'm thrilled to announce that the XHouse5 plan set is complete and available for order. The XHouse5 is the second plan set to implement the high performance USA New Wall and Swedish Platform Framing designs first offered in our Lagom House family of designs. Now this energy efficient design is available in a bigger 3 bedroom house, one with room for expansion in the attic level. The XHouse5 finds itself in our Stealth House Group as it lends itself to fitting well in existing neighborhoods, as well as new neighborhoods following traditional planning methods. 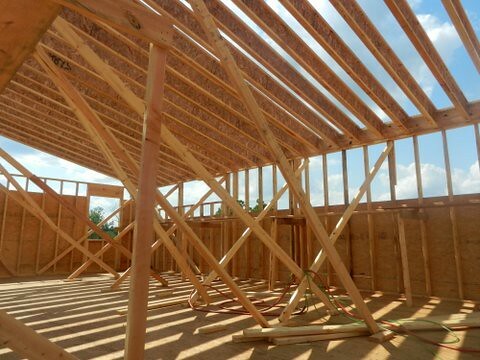 Continue reading "XHouse5 - Construction Prints complete"
This is the first carpentry step in framing the house. Floor deck goes on top of the foundation, and they you are ready to start on the walls. Then it will really start to look like a Plat House! The builder is using truss joists, or I-Joists, which is good. The Plat House has an 18ft span for the main floor which is pushing it for regular lumber. The I-Joists can be made stiffer, and the floor less bouncy. Remember the Plat House comes in both 2bedroom and 3bedroom configurations. 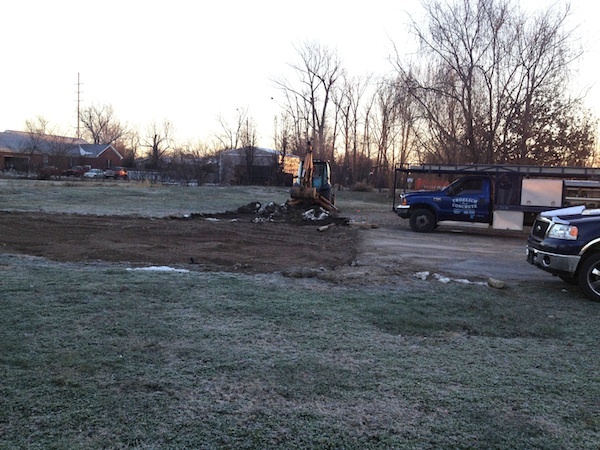 Continue reading "New Arkansas Plat House - floor deck underway"
New Arkansas Plat House is in the ground! 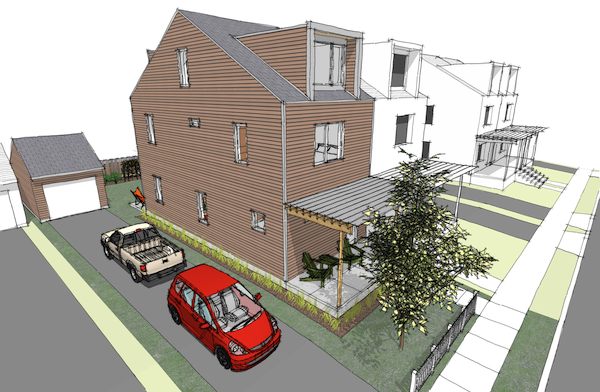 We are really looking forward to tracking the construction of three Plat House Projects this spring. The first one out of the gate is a new Plat House in Arkansas. 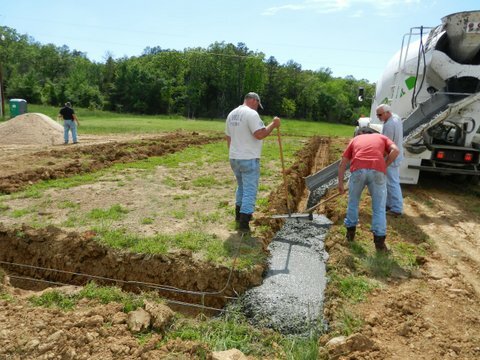 The footers have been dug, rebar placed, and the men in galoshes are pouring the concrete. 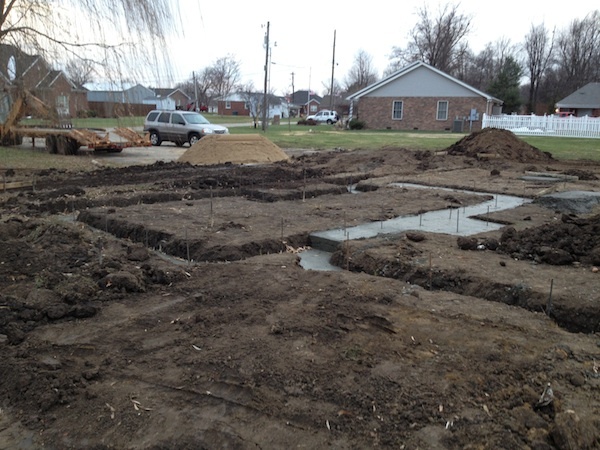 It is a good day to commence a Plat House! 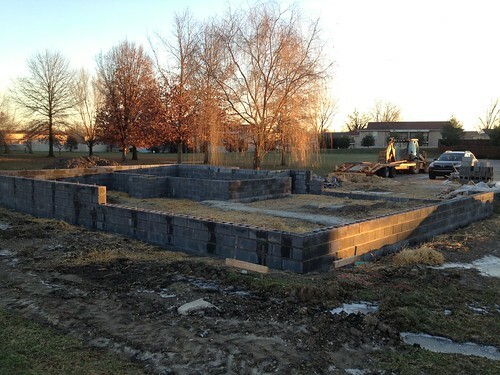 Continue reading "New Arkansas Plat House is in the ground!" courtesy of the Vermont Plat House owner - thank you! Continue reading "Vermont Plat House at sunset"
Back in September 2012 Scott Hedges and I presented a summary of our research into Swedish building techniques at the Fall conference of the Association of Collegiate Schools of Architecture. That conference was focused on off-site construction. Part of the fall-out from that conference was an invitation to present at another conference, this time organized by Pennsylvania State University's Pennsylvania Housing Research Center and held towards the end of February 2013 in Allentown, PA, and at a Conference on Pre-Fab building in New Zealand in March 2013. 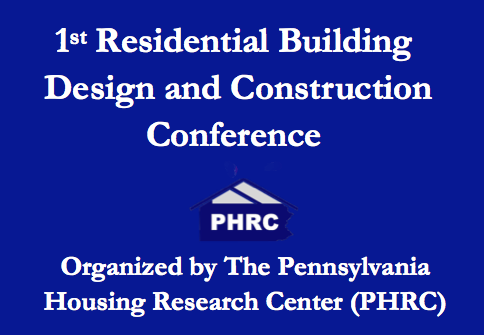 PHRC organizes several conferences each year, notably on Land Development and Housing. These conferences are attended by Developers and Builders, both coming to present their work and to hear about the work of others. This year PHRC for the first time held a conference on Residential Design & Construction which is where our research was presented. The subject matter was broad on all manner of research. The conferences on Housing and Land Development were held concurrently at the same venue, and there was some mixing of the groups who were free to attend talks in the other events. And these events are annual, so the same kind of gathering will take place next year as well. 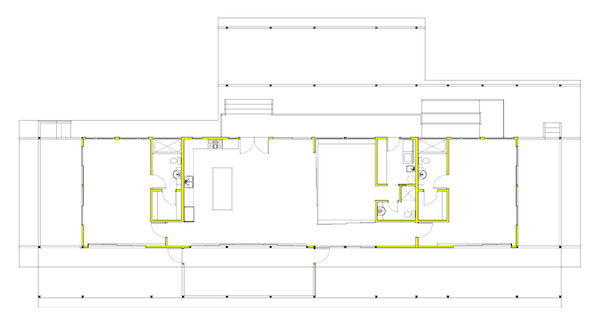 Continue reading "Presenting our Research into Swedish Housing, continuing"
Last month we posted the floor plan of an extensively modified Plat House that was shipping out to a customer in Hawaii. Today we have an equally modified Plat House going out to a customer in Oregon. While this one also takes off from the 3 bedroom version of the Plat House, the big transformation here is in the living areas, more so than the bedrooms. Its looking like these two may go under construction at the same time. That would be fun! Continue reading "Extensive Plat House mod's continue"
I came across a great series of videos on YouTube from a Swedish catalog house builder showing the insulation steps in completing their walls. This catalog house builder happens to work on site, not in a factory, so its particularly useful for American builders trying a Layered Nordic Wall system like USA New Wall building it on site. This first video shows the primary wall cavity being insulated. Note how easily the stone wool is cut and handled, and how it friction fits into place without stapling. 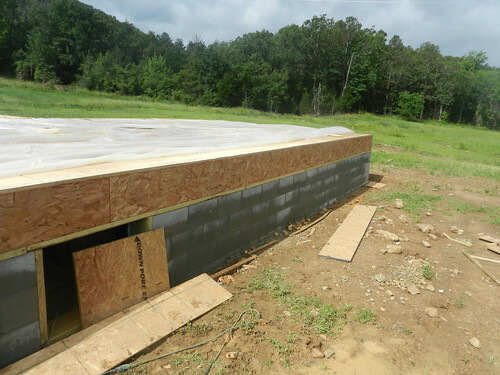 See that the insulation can be easily slid vertically to fit into concealed areas, such as behind the ledger for second floor joists as in Swedish Platform Framing. Now in this second video they will be installing the horizontal furring, which in the USA New Wall forms the wiring chase. The astute reader will say "Hey, where is their vapor control layer? They are putting up the furring without it?" If so, good observation. The reason is that this manufacturer builds their wall a little bit differently. This first layer of horizontal furring is mainly to create a thermal break for the studs. After they insulate this layer of furring they will go over this with a vapor control membrane, and then a second layer of vertical furring that forms their wiring space. This is actually a very effective system, because this second layer of furring is offset from the studs breaking the remaining thermal bridges where the first furring rests across the studs. They get a complete thermal break just like you do with continuous exterior insulation, but none of the complications with window frames and flashing details. Watch them do this in the next video. You'll see that they have a vapor control layer installed around the entire interior, walls and ceiling - interior partitions are not framed yet, only bearing partitions. So you can see how there is an air tight "bag" around the entire conditioned space. Continue reading "Building High Performance Walls, Working with stone wool"
We had this dialog via our Facebook Page this week, and I thought it hit on several common questions about building with USA New Wall & Swedish Platform Framing today, as in right now - not some point in the future when all that is wrong with house building in the US is fixed. 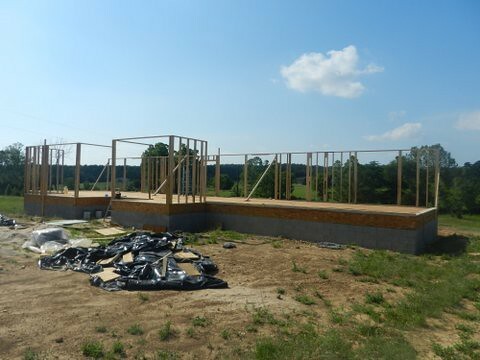 NM: I am a small builder and am interrested in the Swedish Platform and USA New Wall framing. I am curious though if you have any photos or information on how the electrical is installed in the electrical space. Does the electrician need to do any special? Thank you for any information. LamiDesign: Nothing special really Nathan. If you are using a 2x wiring space then you would use a 4x4x1.5" box, with a switch plate reducer cover - that will extend the 1/2" to the surface of the drywall. The 4x4 box actually has a bit more room inside than a typical single gang new work box, and being shallow makes the electrical work a bit easier IMO. The boxes can be screwed through the back to the main cavity studs, or through the sides into the cross furring - so there are actually twice as many options for where to mount them. Continue reading "Interesting + Informative dialog on implementing USA New Wall & Swedish Platform Framing"
This interesting site gathers a readership from the industry side of modular home building. 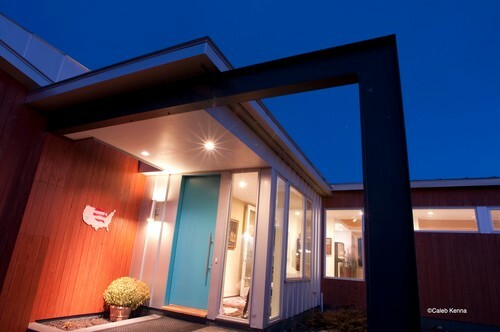 These factory owners and officers often don't understand why Modern PreFab vendors chase after this seemingly narrow slice of the market while it is obvious that most people buy traditionally styled homes. 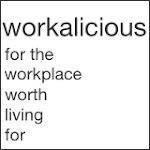 I wrote in to offer my observations on why a business might chase after this seemingly niche market. Check it out. Ultimately this strikes on the very reasons why we have developed a catalog of modern house plans. There is a small but strong interest in homes like these, and it is an interest largely ignored by the market. Serving this niche is just a smart strategy. Continue reading "Guest blogging today at Modular Home Builder"
We are working on an extensive modification to a 3 bedroom Plat House for an customer in Hawaii. We are hoping this will be the next construction project we track here on the blog. The house includes some interesting changes, such as the rearrangement of the bedrooms to create two master bedrooms. 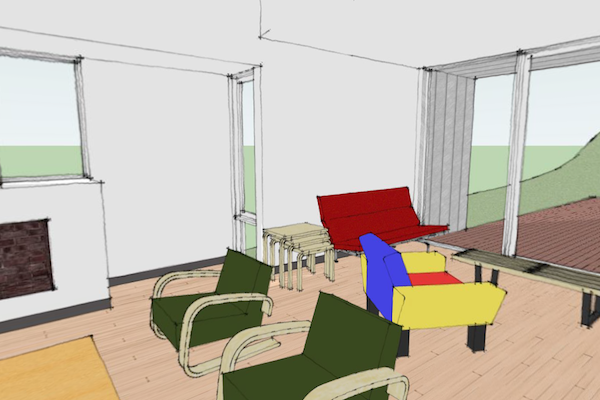 The third bedroom will do double duty as a library/study, separated from the living area with sliding screen walls. Keep watching for this one here. Continue reading "Plat House Mods on the boards"
In the number one position is the 0242 Plat House, our long standing best seller! Followed closely by the 0367 Porch House, a favorite weekend cabin. In the number three position, no surprise, is the 3bedroom version of the Plat House, 0971. Right on its tales is the much loved 0518 U House. 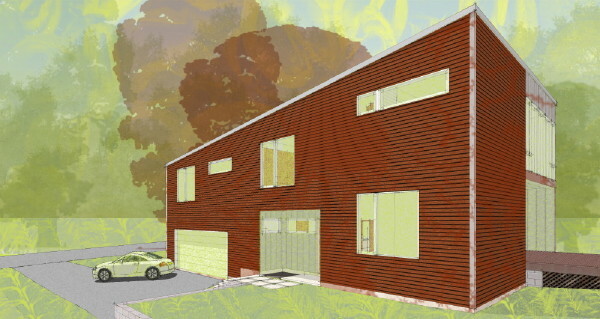 And rounding out the top five, and just nudging out two other designs by 1 view is the 0751 RS House. Continue reading "This Weeks Top 5 House Plans, Jan 2013 week 4"